In a medium to large skillet, over medium high heat, cook pancetta in 2 tablespoons of butter until crisp. Add onions and sauté for 2 minutes. Add 2 more tablespoons butter, cabbage, salt and pepper, cover and once mixture is hot, reduce to medium and cook for ten minutes. While cabbage mixture is cooking, cook No Yolks® noodles according to package direction and drain. 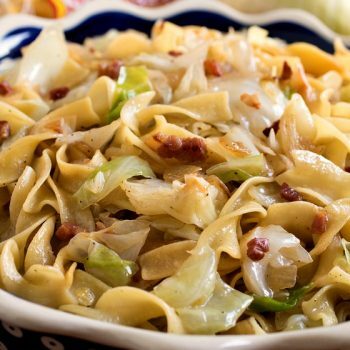 Once cabbage is tender, remove cover and add drained noodles. Add remaining butter and cook to bring to serving temperature.